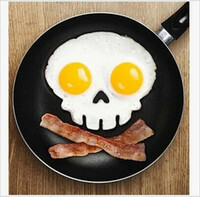 I love experimenting with food ! This was the result of one such experiment, an amazing tasting soup! I had no plans to make soup for dinner it just went that way. It all came together when I was cleaning the refrigerator and came across a very small amount of leftover Thai green curry paste I made to use in a fish curry. I grew up in a home where my Mother put all the leftovers , no matter how small, in the refrigerator. Her logic is that some one will get hungry and need a little snack. Her logic was correct someone always ate the leftovers. Growing up like this thought me to not be wasteful and now in my own home I too put all the leftovers in the fridge – no matter how small. So being that the leftover curry paste was not enough to cook another curry or any other big meal I came up with the idea of adding it to or making a soup with it. I don’t know about you but I’ve never come across green curry soup. 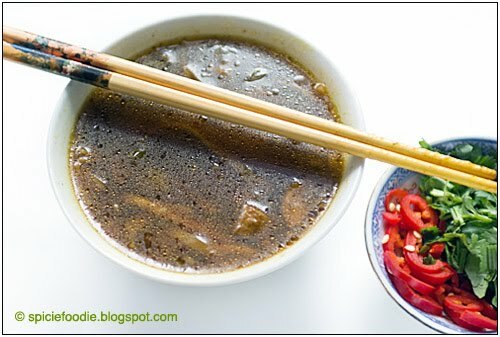 I quickly started picturing in my head how to use it as an additional flavor to a light soup to serve as an appetizer. I don’t have exact measurements for you since it was just throwing in a little bit of this and a little bit of that, so I’ll be giving you rough estimates. 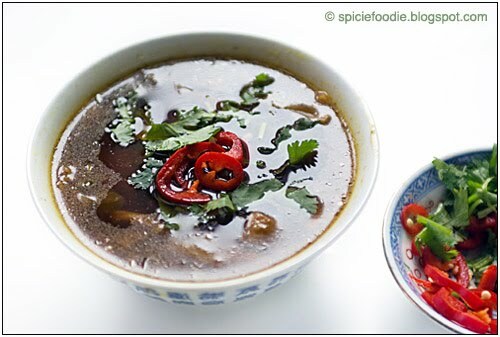 You can experiment with the ingredients to adjust it to your own taste, maybe less spicy or even spicier. I also had 4 small button mushrooms in the refrigerator so I added those too. 1. 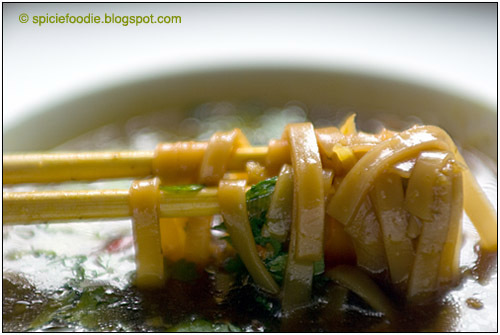 Fry the garlic, onion and ginger first – once garlic is cooked add curry paste and fry another 3 minutes. Next add ginger and lemon grass powder, mix and cook another 3 minutes. Add the sliced mushrooms and cook another 5 minutes. 2. Add water , bouillon cube , soy sauce and fish sauce. Stir to combine/ mix ingredients well. Cook until the mushrooms are completely soft and cooked through about 15 minutes,Or longer to allow flavors to combine better. 3. Right before you are ready to serve the soup add the quick cooking noodles to the soup and boil until the noodles have cooked through 5-8 minutes. 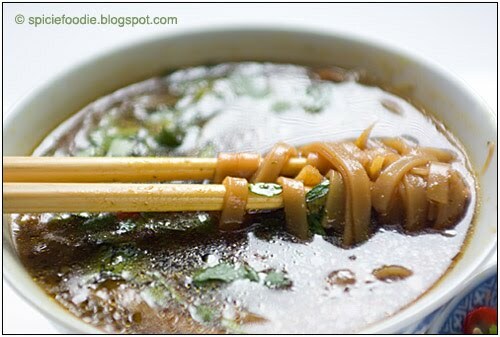 You could also cook the noodles separately and add them to the broth right before serving. Serve with fresh chopped cilantro, lime slices , sliced chilies (optional) and chopped scallions. The soup was tasted so so good it was both spicy and a bit tangy. But it also had a very fresh taste from the fresh cilantro, which I think also helped it feel lighter for warm spring weather. My recipe may sound a bit strange at first but trust me the soup was so good that the main course was ignored until all the soup was gone. I can’t wait to make it again soon and I think it will be the main course instead of just an appetizer. what a great idea! i've never seen green curry paste mixed with non-coconut milk before. I will have to give this a try! this looks great! I'll have to give it a try! You do like your spices! Looks great. Green curry is a nice spice to me especially it comes together with some lemon grass. I like your adding of fresh cilantro into the spicy, tangy soup. What a delicious soup! I love these flavors! Hey, did you get my email about the guest post the other day? @ 5 Star Foodie, Hi Natasha, yes sorry I just replied to it a few minutes ago. I've been quite busy and have now just had time to go through my email. Thank you for sharing. 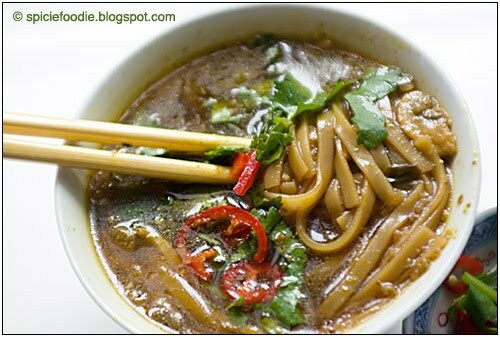 I love noodle soup and Thai food. What a great combination! My pleasure :) and Thank you! Gosh – this looks so yummy!!! !